The ultimate protection for your camera! 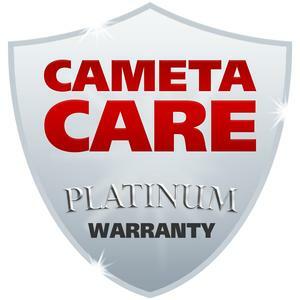 This Cameta Care Platinum 3-Year Warranty promises that the covered equipment will be guaranteed to operate properly according to manufacturer's specifications for a period of three (3) years or we will repair the equipment to operate properly at no charge to you (this includes all parts and labor). This warranty covers any digital camera -- including new, refurbished and factory demo items -- that is initially covered by a manufacturer's warranty, and falls within the indicated retail price range. The warranty also covers one standard kit lens bundled with a camera by the manufacturer. This warranty does NOT cover equipment which has been misused, tampered with, modified or intentionally damaged. Accessories not covered: flashes, batteries, power adapter, digital media, software, LCD (non-manufacturer defects), additional lenses, and additional accessories or other expenses or consequential damages. Bundled items supplied by retailer are NOT covered under the warranty. Coverage starts from date of warranty purchase. Platinum Warranty must be purchased within 30 days of product purchase. Platinum Warranty valid in USA only.